Wordless picture books are a treasure trove of quality illustrations that engage both younger and older students. Without the support of words, these richly illustrated books offer a visual landscape of intriguing details that invite the “reader” to interpret. Wordless picture books have wide appeal. Non-readers, English language learners, emergent readers, early readers . . . all can discover a story between the covers of a well-illustrated book. Such an inclusive dynamic is literacy gold in the world of shared reading, and ideal for the multi-age Montessori classroom. Experiencing wordless picture books as a whole class or in a small group means opportunity for literacy-rich conversation and collaboration. But, what is the best way to lead a “read aloud” of a wordless book? Begin by rethinking the traditional role of the adult, and consider the children as co-constructors of the story. Hone your observation and listening skills. Get ready for the unpredictable as all will bring their own experiences to the conversation. Follow the reactions and interests of the children. Montessorians . . . you’ve got this! Highlighted below are a few guideposts to follow when presenting a wordless book to children 3 to 6. 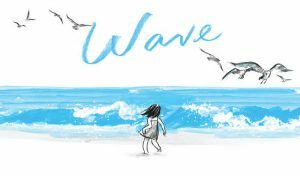 I’ve referenced examples from an outstanding summer-themed picture book entitled Wave by acclaimed artist, Suzy Lee. Visit the author’s website to see more examples of the illustrations. Book summary – Evocative illustrations perfectly capture a little girl’s day at the beach as she engages in imaginative play with an ocean wave. Followed by a flock of seagulls, she chases the wave as it recedes, runs from it as it surges, splashes in it when it calms, taunts it as it rises, and finally succumbs to it crashing down upon her, only to discover the treasures waves can bring. Prepare for the read aloud by finding what brings the story to life. The girl’s facial and body expressions, the reactions of the seagulls, and the give and take of the wave drive the narrative. Keep these points of interest in mind as you lead the read aloud. They provide a framework for building the story. Invite the children to look at the cover which shows the girl standing on the beach surveying the ocean stretching across the horizon. This stunningly simplistic scene has universal appeal. Spend time looking at the cover and talking about the book’s title. Entice children to want to know more about the setting, the child, the birds; ask for predictions. “I wonder what the little girl will do on the beach?” Time spent on the cover is never wasted! It is like the poster for a movie – just enough of the story is there to entice. Before you leave the cover, be sure to mention the author’s name and explain that Suzy Lee is an artist who tells the story with pictures. As you page through let the spontaneous reactions of the children guide you. Point to the things that interest them to help everyone follow along. Keep in mind your role is not to lead the children to a particular idea, but to help them to understand how to find meaning in the illustrations. Use questions to initiate conversation. Think sensorially first. Ask, “What do you see?” If a child responds with an inference, “The little girl is being scary,” follow up with, “What do you see that makes you say that?” Giving evidentiary support is very important. It draws attention to the details and shows how the clues for the narrative are all in the pictures. It also keeps the narrative on topic. Some children may respond to the illustrations in a nonverbal manner; for example, mimicking the little girl’s growling facial expression in the image above. Engage the nonverbal child by asking “What sound is the little girl making when she makes that face?” “GROWL!” This book has a very playful theme; so, go ahead, GROWL with the children! Model how to tell the story with a focus on the words the children use. Acknowledge your students as co-constructors of the story by recapping each page with one sentence that incorporates the key ideas and vocabulary presented by the children. Use onomatopoeia, expressive voice, humor; whatever builds interest and models for the children the fun of storytelling. Make meaning from the design of the book. Integral to the story is Lee’s intentional use of the gutter, the vertical seam where the pages are bound. Lee uses the gutter as a boundary between the world of the girl and the world of the wave. She also distinguishes both worlds with color. The little girl’s world is always on the left in tones of grey; the wave’s world is always on the right in tones of blue until the gutter is crossed and the two worlds meet. Highlight the gutter by running your finger down the center to emphasize the dip in the page. You can also use a blank piece of paper to hide one side. See if the children notice that the girl’s hand disappears into the gutter on one page. This is an intentional representation of a transformational moment as the girl is literally absorbed into the center of the book then appears on the other side ready to bravely take on the wave and get soaked. Resist the temptation to explain the author’s intent; instead, help the children to find their own meaning with a question. “I wonder why we can’t see her hand?” They will surprise you with their ideas and insights. Make the book accessible after the read aloud. This is the time of emergent reading or pretend reading. A familiar book will prompt storytelling or retelling between children, or quiet reflection by some. When children use wordless picture books to create their own stories, they are taking a significant step toward reading. Use extensions. They can help young children think about the story in a different way while building vocabulary and pre-reading skills. On a Sandy Beach Lotto is one example offered on this site with stunning illustrations of the “treasures” to be found on a sandy beach. It is a matching activity with an identification chart for oral language development. You can also support the child’s understanding of the parts of the picture book with our Picture Book Nomenclature extension. A great teacher resource for learning more about child-centered, conversational read alouds is Reading Picture Books with Children – How to Shake up Storytime and Get Kids Talking About What They See by Megan Dowd Lambert.